A little more effort could produce something interesting. Ole Scheeren’s Mahanakhon in Bangkok. Nice. He also did the CCTV building in Beijing with Rem Koolhaas. Thanks for reminding us the top-tier inventive design in East Asia puts the vast majority of NYC’s output to shame. 432 Park was designed by Vinoly whose other work includes 20 Fenchurch (‘Walkie-Talkie’) which has an amazing observation deck, but also won the Carbuncle Cup (for ugliness). I’ll try to make a larger version, but basically I used the Municipal Art’s Society’s tool (https://www.mas.org/initiatives/accidental-skyline/) to look at Macklowe’s site (the 5 addresses from the article are in green). 10 East 52nd is not part of the proposed site for an unknown reason, though the Venezuela consulate building IS among the addresses in the article BUT not the John Peirce landmark residence next door 11 East 51st (in orange outside the green site boundary). The total AIR rights available from all of the properties on the block (not just the 5 properties listed as an assemblage) comes out to just under 250K sf while St. Patrick’s across the street has 1.2M available for transfer. The 250K figure does not include the TOTAL development rights if buildings were razed as opposed to having their rights transferred. The Walkie Talkie is a total disaster. FAA aside, what is the highest we could get in NYC if all variables came together properly? There is no height limit on this site so it is FAA: 2000 feet max or 1776 ‘gentleman’s agreement’ to not go beyond 1 WTC. I did the math and if Macklowe razed just the five addresses mentioned in the article he would have 257,421 sf to play with (the article says 280K sf but I don’t know how they got that number). There are 132,893 sf in air rights available from the 3 Landmark buildings on the block to be developed (there is a fourth with none available to sell). 10 East 52nd Street is the one parcel that is neither mentioned as being part of the assemblage nor is a landmark on the block to be developed. If Macklowe bought and razed it he would have another 36180 sf available. If he only bought the air rights there would be 18331 sf available. There are 1.2M available from St. Patrick’s across the street to the South and a total of 224K sf available from 6 buildings on the block directly north of the site. Assuming Macklowe bought all air rights available from the 3 blocks I mentioned, razed the 5 building assemblage and was able to add 10 East 52nd street to the main group he would be able to erect a 1.85M sf building on a lot of 22,550 sf (compared to One Vandy’s 1.7M sf or 432 Park Ave’s ~410K sf). Floors without a cantilevered extension would be somewhat small for an office building, but perfectly fine for a condo. If there were no cantelevers or setbacks 1.85M/22500 (lot size) = ~82 floors. In the Real Deal article they suggest that Macklowe plans to build a structure “more than three times as large” as the 280K sf mentioned as of right for the assemblage - around 1M sf. It also sounds like at least one of the property owners has no plans to sell (the loser!). If there is more than one owner like this than this whole project might be a Macklowe stress fantasy as he goes through a divorce. He’s pulled surprisingly welcome rabbits out of hats before so I guess we’ll have to give him the benefit of the doubt. The gentleman’s agreement is silly as it goes against the very spirit that defines NYC. However, I digress. Could a building actually be built in NYC over 2000 feet if the FAA approved? Are there any parcels that would support that much height? It all comes down to zoning/FAR allocation, and the design. I think the one parcel is where the javits center currently sits. Also, Hotel Penn. The Penn Station district offers incredible potential for a mega tall. If only they could relocate that toilet bowl thats taking up precious space and fix the station below it. They need to remove FAR period from certain blocks. Essentially remove the zoning to allow for unlimited potential. Parts of Midtown East could use it. btw, a collaborator with Gensler said 500 meters (>1600ft). That could be an approximation, we’ll see. 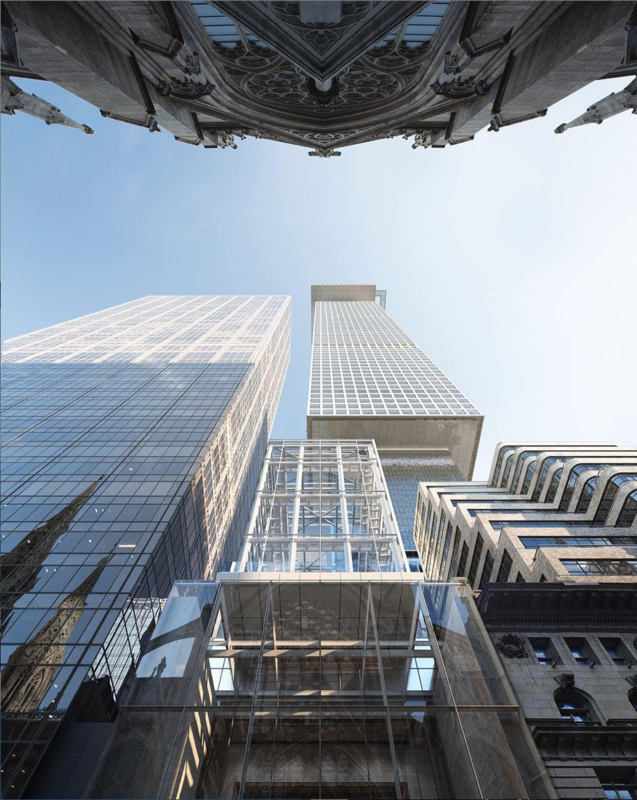 The developer Harry Macklowe Real Estate is planning a breathtaking 500 meter supertall skyskraper on Manhattan, New York, called Tower Fifth. It will be one of the tallest buildings in the world. New York City is undergoing an architectural renaissance with the construction of supertowers with impeccable looks and a sense of grandeur. We at Tomorrow are happy and proud to collaborate with Gensler and reshaping New York’s skyline by putting the next 21st-century building on the map. The middle section looks awfully blank… 432 Park but beefier. Which doesn’t work well. It works for 432 Park because it’s slender. All of the buildings on East 52nd Street were built from 1927-1930 according to Property shark (including the glass-clad 14 E 52). It is sad to lose Art Deco buildings but this is a rare opportunity. I’d like to petition the owner of 10 E 52 to sell his/her’s if I could figure out who they are (of course the most plain of the bunch is slated to survive). I will believe it all when it happens, I mean how many more condos does the 1% really need? But it will be very cool if it does. except that this is not a condo building as of yet. Its an office development. Am I in the minority of liking this obnoxious Walkie Talkie? Maybe I like it cuz I don’t live there. I don’t know. I would take 20 fenchurch over a box any day! I agree honestly. Making that a supertall and much thinner wouldn’t look too bad as long as you take away the whole warping-cars issue. I’m not a fan, but it will be amazing to see in relatively close proximity a 1,050’ tower (Verre), a 1,300’ tower (1 Vandy’s roof height), an approximately 1,400’ tower (JPMC), and a 1,550’ tower (Chez Macklowe) with several other supertalls not far away (432, Steinway, One Central Park, and 157 W 57th).